CPI report suggests inflation is stabilizing or even retreating to levels significantly below Fed targets. The door appears wide open for the Fed to continue applying highly stimulative monetary policy. 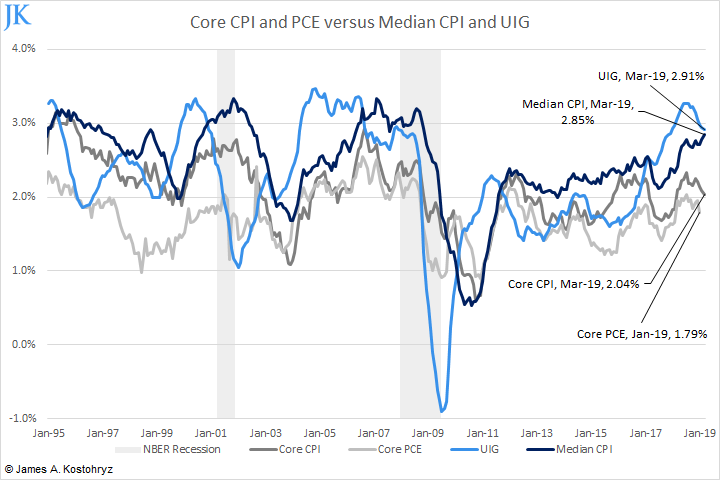 There are underlying inflation pressures that are currently not being reflected in CPI and PCE. A nasty inflation surprise might be forthcoming by late 2019 or early 2020. According to the report released on Wednesday, April 10, 2019, by the Bureau of Labor Statistics (BLS), the Consumer Price Index (all items) increased 0.4% in March compared to a 0.2% increase in February. Over the last 12 months, the headline "all items" index increased 1.9% compared to the 1.5% rise for the period ending in February. However, the "core" CPI Index (ex food and energy) increased only 0.1% in March, which was the same as the increase in February. The year-over-year increase for the core CPI was 2.0%, a slight decrease compared to the 2.1% rise registered for the period ending in February. Roughly 60% of the increase in the headline "all items" CPI was attributable to significant increases in the energy index, mainly driven by increases in gasoline prices. The slight easing in the growth of core CPI has incited bullish reactions from most financial market participants. The core CPI figure suggests a probable reading of about 1.6% in core PCE, which represents a considerable distance from the Fed's core PCE target of 2.0%. Indeed, some Fed officials have suggested that they would prefer to see the core PCE accelerate to 2.5% before applying any significant monetary tightening. Therefore, the upshot for many financial market participants is that the deceleration of core PCE in March leaves the door wide open for the Fed to proceed full throttle for the foreseeable future with its currently highly accommodative policy. How accommodative is the Fed's monetary policy, currently? First, the Fed Funds rate is about 100-200 basis points lower than suggested by most credible variants of the "Taylor Rule." Second, the Fed has announced that its policy of quantitative normalization will end in September 2019, meaning that the vast majority of the monetary stimulus provided by the Fed during QE will remain in the financial system for an indefinite period. This, in turn, implies an indefinite prolongation of financial conditions characterized by excess liquidity that have prevailed in recent years. The extraordinary level of monetary stimulus that's being provided by the Fed is extremely bullish for stocks and bonds - at least in the short term. I encourage readers to subscribe to Successful Portfolio Strategy where I discuss the current extraordinary level of monetary stimulus in significant detail. There, I elaborate on my Taylor Rule analysis of the current Fed Funds rate and my proprietary model of the systemic US supply of liquidity. Too Much Complacency About Inflation? Low inflation - and the highly accommodative monetary conditions that this permits - is clearly bullish for stocks (SPY) and bonds (TLT) in the near term. But this begs a question: How long can low inflation persist in such a stimulative monetary environment? I think most market participants are excessively complacent about how long this situation can last, and what the ultimate outcome will be. In this regard, it's important to note that underlying inflation pressures are actually more robust than can be detected from casual observation of the aggregate CPI statistics. I will cite just two examples of indicators that illustrate this point. First, the New York Fed's Underlying Inflation Gauge (UIG) (All Data) is suggesting overall economic conditions that are consistent with an annual inflation rate of closer to 3.0%. Second, the Cleveland Fed's measure of Median CPI just surpassed its 10-year high in March, registering a rate of 2.85%. This means that the majority of prices in the US economy are rising at a rate above 2.80% - a state of affairs that's actually quite consistent with what's being flagged by the New York Fed's UIG indicator. The fact that the majority of prices in the US are accelerating at a rate above 2.80% suggests that there are significant underlying inflation pressures that are not currently being reflected in CPI or PCE due to various statistical effects (component weightings and outliers). Note that in the past year or so, the gap between core CPI and PCE on the one hand and both UIG-All Data and Median CPI on the other has been widening in the context of an upward trend in inflation. Historically, this state of affairs has tended to result in CPI and PCE moving higher, with a lag. The extraordinary level of monetary stimulus that's currently being provided by the US Fed - precisely at a time when leading indicators of underlying inflation are signaling significant upward pressures - raises the specter of a possible nasty inflation surprise in the next 6-12 months. Indeed, my own forecast is that measures of US core inflation will be rising at an annualized rate of 2.5% to 3.0% by the first quarter of 2020. I believe that US and global financial markets are currently not well prepared for this. The stabilization of various measures of CPI and PCE inflation well below the Fed's targets is extremely bullish for stocks and bonds. This is one more reason that I expect significant new highs in US equities, and my model portfolio in Successful Portfolio Strategy reflects this. However, I think that it's quite likely that the inflation environment will be very different by the end of 2019 and the beginning of 2020. This will pose a major unanticipated challenge for fixed income and equity prices at that time. If you enjoyed this article, and would like to follow my publicly available work on Seeking Alpha, just click on the "Follow" button at the top of the page. If you are the type of person that wants to take your skills as an investor to the next level, Successful Portfolio Strategy is something you should really consider. Never has it been so critically important, as it is right now, to have the right portfolio strategy. Successful Portfolio Strategy will provide you with the knowledge and the tools that you need to put a winning portfolio strategy in place and successfully manage its practical implementation.